IMAGINE FOR A MOMENT… if this was you or your mother…. IMAGINE …. that you are an elderly widow. 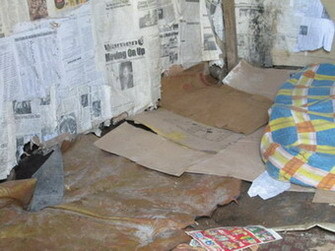 You have only one thin blanket and a mat on a cold dirt floor to sleep on. You feel something brush past your toe. You are relieved to know it is only a rat, not a thief. IMAGINE…your worst pain ever…your head is throbbing, you have a fever and every bone in your body hurts. 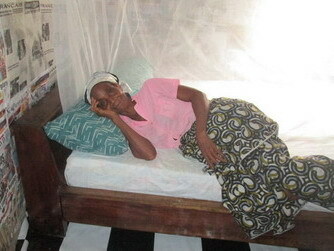 It is probably malaria again. You have no money for pain killers, nor for treatment. IMAGINE … eating “just enough” to take the hunger pains away, but not enough to satisfy. You are saving food for tomorrow so the children can eat. 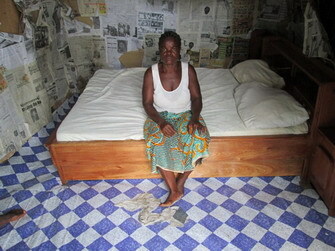 FRIENDS, this is a reality for many of our widows in Liberia who are still waiting for help. Ma Mary Leeway runs our Feeding Center in Kpaytuo Village. Today she has a nice new bed! 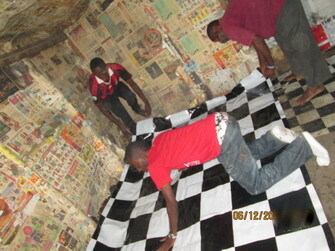 This was Ma Christina’s room before her renovation. What a difference! She is so very grateful. Ma Sarah cannot believe this is happening to her. Students from our “Leaders in Training” do the work. Daniel is moving the goods in to get started. 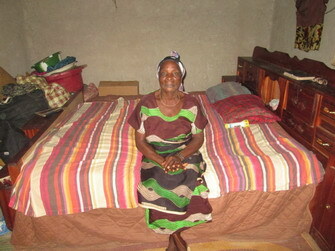 Ma Annie has tears of joy, as she rests on her new bed. 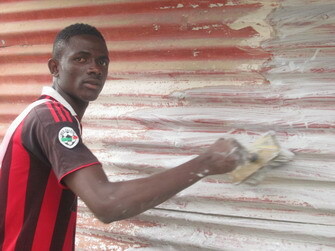 Jeremiah Gaye is painting the walls. Daniel Coleman and others are laying the new flooring. God is a DEFENDER OF WIDOWS and we certainly have seen HIS FAVOR on our widows. 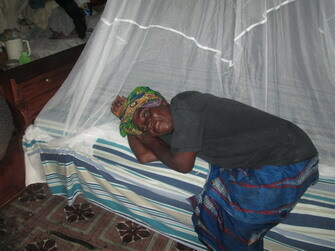 Presently we have 225 widows on our program. We have 2 rice distribution centers. One in New Matadi and the other one in Harper, Maryland. 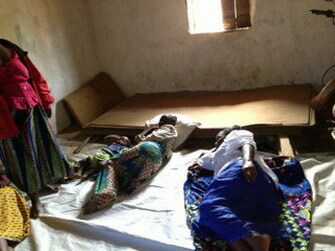 We help with medical issues too as funds allow. In a developing nation that has been through so much war and turmoil, it is the widows and children who have suffered most. 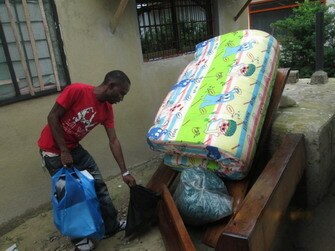 For $250 we can buy a bed, blankets, pillows, a mosquito net and put in new flooring. If the roof is leaking we can repair that for $50. WHAT A HUGE DIFFERENCE THIS MAKES TO THE COMFORT OF OUR ELDERLY WIDOWS. THIS WOULD MAKE A GREAT CHRISTMAS PROJECT FOR A FAMILY THIS CHRISTMAS. Click here if you would like to make A DONATION or CAll Karen at 250-454-9456 for Credit Card Donations. Hello Karen,our wish in God’s gratefulness you are keeping well.Just a question would you have something we could use to advertise with your Christmas project? If we were to join with you in raising some funds for your mattress project.We are looking at a way in presenting this to our congregation in Church.Thanks for now. Thank you Warner and Marion for your heart for our work with the poor in Liberia. Our widows are some of the most desperate people on earth. 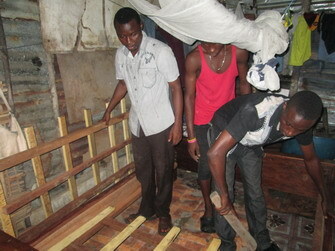 Even the government of Liberia has recognized us with our endeavors for the widows. They say many charities come in to help the children, but seldom do they see charities that help the widows. We welcome you as an advocate for these silent ones who suffer so. God bless you!